OK… now you’ve got it, open the foil and inhale. Just smell that gorgeous vanilla with the hint of biscuit from the crumble on top. 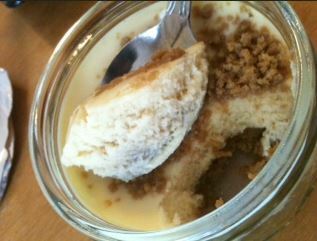 Now, take a small spoon and penetrate that creamy baked cheesecake top slowly. Savour the first bite by doing everything in slow motion. Break through the biscuit crust and scoop out that precious first bite. Now, slowly take that first bite… slowly savour the flavours in the base and the smooth, gorgeous cheesecake top. Ooooo gorgeous! Wasn’t that amazing? Aren’t you glad you took my advice and popped out to buy yourself a back? Don’t you wish you had another? Ya, me too… Those were absolutely awesome and because they are a plain vanilla cheesecake you can add any kind of topping – including salted caramel (I know, I’m drooling too now) or chocolate syrup. Describe your ultimate Gu Pud and you could win a portion of the profits! Pop over to their Facebook page and enter their competition and you could win much more than a free pud but you’ve got to be in it to win it (as they say) so recover from your New York Cheesecake Gu Pud coma and get creative! Feeling guilty about those glass pots and being wasteful? Not only can you recycle them but you can bake chocolate chip cookies in them! So weird… I loved the Guey Chocolate Torte, but Dom hated it. 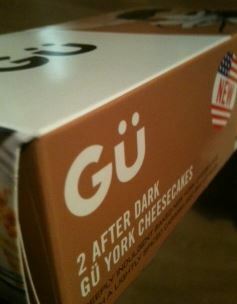 You loved their Gu York Cheese Cake and that was the one I hated! Now we have to work out which one Dom loved that you hated, to complete the circle! After Dark Choc & vanilla cheesecake. Thank you very much for the tip, didn’t think about the salted caramel. Will definitely try it !